After a "reduced guilt" disappointment or two, and a Trader Joe's fishy failure or two, I was thinking this product might be a bit of a gamble. But on a recommendation from one of our readers (Thanks shanaelyse), I decided it might be worth taking my chances. With a price tag under $3 at our local Trader Joe's, not much is lost if it isn't the best thing ever. 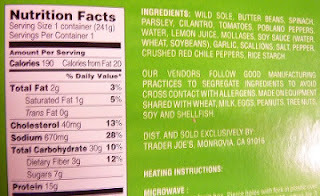 And, to be fair, we've seen our share of tasty fish from TJ's: think Fish Nuggets, Cod Fillets [sic]*, and Mahi Mahi. I went ahead and took the lazy route and microwaved the fish. It was extremely simple and involved poking holes in the plastic wrapping and pressing a few buttons on my magical radiation machine. The total heating time was 8 or 9 minutes, which isn't bad if you're cooking it at home, unless you have some serious patience issues, which is entirely feasible in this age of instant gratification. But the 8 or 9 minutes might glean you dirty looks from co-workers if you're heating this fish in a heavily-used office break room microwave. My point is that it's all relative. Even I can wait 9 minutes for tasty fish, and I'm one of the least-disciplined people I know. And, incidentally, it was tasty. Surprisingly so. The fish was tender, moist, and only tasted mildly fishy. It flaked off the filet with the slightest touch of my fork. The flavor of the fish was delicate and light, and it let all of the other amazing flavors through. Though I was a fan of the fish, I must say that all of the other ingredients were even better. The sauce was excellent. It was savory, flavorful, and matched perfectly with the taste of everything else in the dish. You can see there in the ingredients list it contains molasses and soy sauce. I've never had anything quite like it before. The butter beans were plump and delicious, and even the soggy spinach leaves were cooked to perfection and blended right in with each of the other elements. This is one of the biggest pleasant surprises we've had from Trader Joe's in quite a while—at least compared to what we expected. And even though it's not quite Pantheon quality, it comes darn close in our opinion. 4.5 stars from Sonia, who was floored when she saw that this dish o' fish only contains 2 grams of fat. Same score from me. *I'm not sure why there's a discrepancy between TJ's spelling "fillet" with two "l's" when it's cod and only one "l" when it's sole. I just wanted you to know it's TJ's fault, not mine. I'm a good speller. It just seems like they should be consistent, right? Please reference this article for more info. I tried the Filet of Sole and it wasn't bad except that I had many bones in my fish! the beans were soggy and I was not that impressed with the meal. if not for the bones it would have been better. I would not buy it again. Just one more coment...did you all eat the same thing I did? I really enjoyed the Filet of Sole. I would pass on the beans for a pasta or rice. 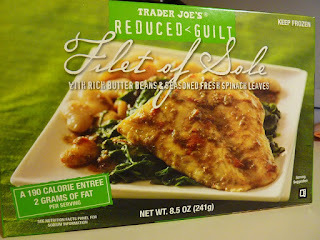 But I was quite impressed with this "reduced guilt" meal. Loved it as well! I cannot believe that was 2g of fat. So flavorful & had great texture. 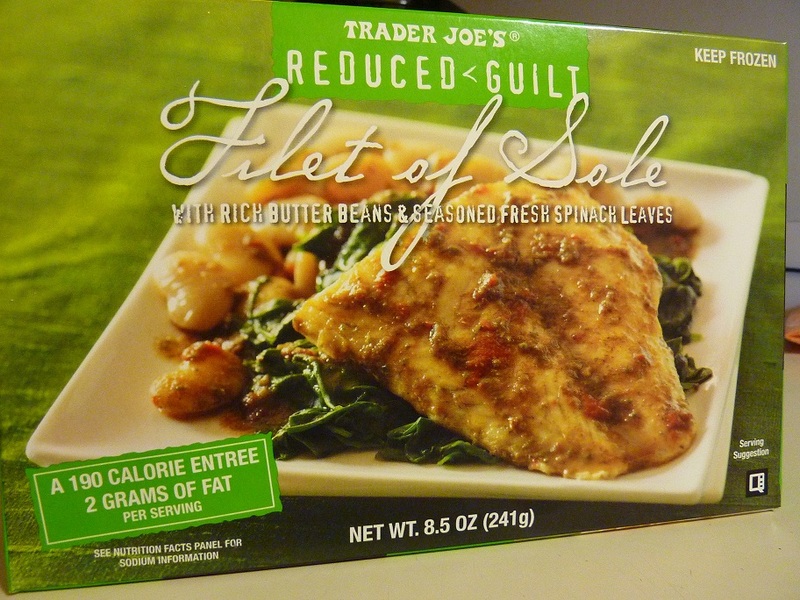 I too love Filet of Sole -- and rarely (unless I'm starving which was the case today) purchase frozen ANYTHING.... so you can guess I broke all of my own personal rules simply because, like a sap, I fell for a picture. OMG -- this was horrid! The picture is an absolute lie -- the beans were mush; I've no idea what the "sauce" was and the fish was, well, tastelessly boring. I sprinkled garlic sea salt and pepper -- no help. I added curry -- better but not even close to be good. Lo-Cal dishes just do not have to be boring and tasteless --ever. Save your money -- buy fresh and cook your own. Wow! I'm really surprised to hear anyone say that. I guess if you're only used to fresh fish, this might be a little bit funky to you. We couldn't disagree more about the taste, but we do appreciate you sharing your thoughts. Apparently this is a "love it" or "hate it" kind of item. Both my partner and I disliked this meal from TJ's. In 3 bites I had 8 bones! Everything packaged with the fish was cilantro heavy mush. We threw them out and went out to eat. Will not buy again.